Imagine taking a trip to the sauna or spa. Great, right? People have used steam to cleanse their bodies for centuries. If we could take a visit every day, we would. Skin feels so much cleaner after a sauna, and bodies feel healthier after a day at the spa. Making time for this is not always an option, and the cost soon adds up. Home facial steamers are a great addition to any home. Over time, an investment in a facial steamer will more than pay for itself, both on your wallet, and on your skin. Using a home steamer is a great way to achieve clean skin and open pores. Some people opt to use creams and oils. These are inexpensive and can make a difference, but they still cost, and they still need to be replenished when empty. A facial steamer only needs more water added. Granted, you need to use electricity, but the cost is so small that it will not be a worry. 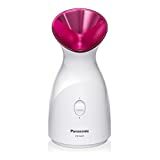 A facial steamer will be the base of a home beauty regime. A lot of treatments are stand-alone, but steam treatment opens your skin to other treatments. It can be combined with other beauty techniques to give you the treatment that you need. Using a steaming machine means softer, younger, and healthier skin. It is unobtrusive and non-harmful. Facial steaming really does make a difference to your skin. This who use them, swear by them. Blood circulation is improved, skin is firmer, congestion is cleared, and so much more (1). I can hear you asking the burning question, how much does it cost? Well, you may be surprised to know that they cost way less than you may expect. Facial steamers (or facial saunas) come in every price range, and with every feature that you will need. We bring you the best we could find. Why should you use a fac​​​​ial steamer? 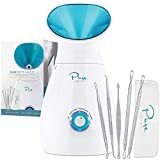 How to find the best facial steamer? How to use a face steamer? What do we love about this device? The steam is pretty cool. Now, we know what you are thinking, steam is steam, right? Well, not with this piece of equipment. The nano facial steamer creates steam particles which are 4000 times smaller than regular steam particles. We cannot claim to know the size of regular steam particles, but 4000 times smaller sounds pretty impressive. This machine is extremely safe. It is easy to use at home. It is efficient and portable. It does not matter what you need the steam for; this device is here for you. Need a short blast? Check. Need a long, calming session? Check. Need to unwind after a long day? Need to get those toxins out of your skin? Check, and check. This is the steamer for you. This device is quite simply one of the best facial steamers on the market today. From acne and blackheads to smooth and soft skin, this portable nano-particle steam machine can take care of it all. The steam is almost instant. No waiting around. This piece of kit is powerful. The steamer is durable and built to last. The nano-particle steam cleanses better than regular steam. The steamer can need to be refilled more often than others. The noise can be higher than other machines. What more could you want than a nice warm steam mist? How about a nice cold steam mist? This face steamer produces both. A warm mist of steam is great for cleansing and opening pores, but what about on a hot day? That cool mist is sounding pretty good right now. A 20-minute program for warm and a 70-minute program for warm mean that this device is unobtrusive. Instead of holding this to your face, you can have it in the same room with you, all while doing something else. Second-hand smoke is always a bad thing, but second-hand steam never is. This nifty little device produces ultra-fine nano ionic steam. The name alone has us wanting to feel it. This type of steam helps to penetrate into the skin, giving great results. There is a small chamber for all your aromatherapy oils, turning this steam machine into a day at the spa. An automatic shut-off means that you can leave it without having to worry about it. A great addition to any room. Aromatherapy oils can be added. It heats up in seconds.An option of hot or cold steam. The facial steamer is not as powerful as some others on the market. The reservoir needs to be filled often. One of the things we love about the Conair facial steamer is the price. Who knew that a home steamer could come at such a low cost, but does it still deliver? While the device is not the fanciest on the market, it still does what it has set out to do. The device comes with a handy timer, a brush for moisturizing and exfoliating, and enough settings to give you the treatment you need. This steamer may be low-cost, but using it will make your skin feel tighter, clearer, and softer. It combats sinus pressure and nasal congestion. The price point of the device makes it very affordable. A timer lets you control your session. The design allows you to focus on nasal congestion. The device does exactly what it says. The power is not as much as many others on the market. Clogged pores, acne, blemishes, whiteheads, zits, and spots. If you are still with us, great, if you are not, then we do not blame you. This device is great for everything we just mentioned. KingdomBeauty has done a great job with this device. The anti-microbial, sauna-like hot mist makes you feel as if you are in a spa. The hot mist will soften your skin, moisturize it, and hydrate. You can say goodbye to clogged pores and unsightly blemishes. So, what sets this steamer above the rest? The steamer has a heating element, when combined with an ultrasonic vaporizer, produces excellent steam. When we are talking about steamers, it is all about the steam. The better the steam, the more it penetrates the skin to work its magic. Better penetration means better treatment for everything on your skin, in your skin, and under your skin (including your sinuses). The device uses PTC ceramic heating elements. The steam produced by these elements is reminiscent of a spa. The large water reservoir is larger than most on the market, leading to longer usage between fills. The device also sterilizes the steam as it produces it. There is nothing worse than unclean steam being used to clean your skin. The device is designed to be portable. The device produces a large amount of steam. The KingdonBeauty steamer feels like a treatment you would receive in a spa. Not as durable as some steamers on the market. The NanoSteamer looks terrific. Like a blossoming flower, the top of the steamer opens up to gift steam to you, but do not be fooled by the gentle look of the device. The aesthetics hide a lot of power. An ultra-sonicator instantly evaporates the water to create steam. This makes it one of the fastest to use steamers on the market. This machine is a lot larger than most portable steamers on the market. It also uses Positive Thermal Coefficient (PTC) ceramic to vaporize the water. This leads to lots of strong and healthy steam. The internal fan helps to direct the steam toward you. The steam is not lost to the cold air or directed away from you. More steam concentration means more help for your skin. Using this device leaves your skin feeling hydrated, nourished, and soft. Great for acne and spots. One of the best on the market for soft skin. Even with the fan, there can be too little steam for some. Investing in a portable facial steamer can make a real difference to the health of your skin, and to your own health. Portable steamers can give your life really value at a low cost, so which is the one for you? The Lavany steamer wins this one. 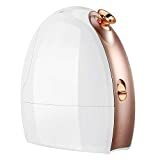 The fact that you can use hot and cold steam makes this a useful appliance, but the addition of an aromatherapy oil chamber tips this one over the top. The NanoSteamer may not be the cheapest, but for the money, you are getting real value. It looks amazing, and the amount of steam is perfect. They blast steam against your face, but how do they actually work? Water is held in a reservoir. Heat is applied to the water (in a variety of ways). Steam is produced. That really is it, in a nutshell. 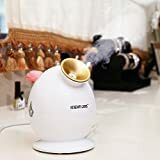 Oils could be added to the water, but some steamers do come with aromatherapy chambers, and we would recommend only using the oils in a steamer which is made to use them. It is usually recommended that you use mineral or distilled water. This helps to limit the bacteria passing through the machine and stops any build-up. Steam is steam, right? Not quite. A big bowl of steaming-hot water is what we always used when we had colds, but after trying an actual facial steamer, the difference is very noticeable. Most facial steamers use a heating element. This creates finer steam, which is able to penetrate the skin easier. It also keeps the steam at a consistent temperature and concentration. Not all steam is equal. This applies to almost every device we own. The quicker it works, the happier we are. Facial steamers are no exception. It may only take a minute to warm up, but that minute feels like an hour. The main thing you need to think about is the size of the water tank. A larger tank will take longer to heat. If you want a large tank, then you might need to be okay with the steam taking a little longer to initially produce. The capacity of the water reservoir is a big part of a steamer. When looking for a steamer, you should always take this into consideration. A large reservoir will mean more time between fills, but it will also mean a larger steamer. You should find a balance which fits your needs. Many beauticians will recommend a treatment of 15 minutes for skin. Some steamers may need filled mid-session. If this bothers you, then you should buy a bigger model, if not, then a smaller model will suit you fine. Many people switch it on and go for it, but it can be worth doing some preparation before diving in. Your face should be clean before using one. Yes, you are here to cleanse your face, but you are cleansing deep. This is not a face-cleaner, and that grime is only going to get in the way. Once you have washed your face, you should consult the manual. While most facial steamers are similar in how they are used, every model has its own quirks. The basics are: fill the reservoir, plug it in, turn it on, and adjust the settings. Once turned on, you will need to wait for the steam to appear. Some models work quickly, but it is never instantaneous. Once the device is producing steam, you need to worry about where to put your face. Some models have a receptacle to sit your face in, some need to be placed close to your face, and some are built to be placed in a room. When you begin to use a facial steamer, you should only use it for a few minutes at a time. You can build up the time slowly to give your skin time to adjust to this new therapy. Once you have built up the time, you can begin to think about the frequency of use. Regular skin will only need a treatment every week or two. Dry skin is best suited to one therapy session every two weeks. For oily skin, a treatment twice a week will benefit you. If you do have sensitive skin or are irritated by the treatment, consult a doctor or dermatologist.